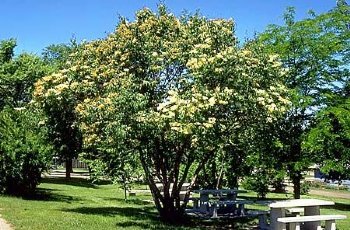 PEKIN LILAC - a tall shrub to small tree which may reach 18 to 24 feet in height on favorable sites. Pekin Lilac is multi-stemmed, non-suckering, and has a glossy cherry-like bark on older trees. Flowers appear in mid-June, are creamy white, and fragrant. Good drought tolerance once established though initial establishment can be difficult in dry soils. Native to northern China. "